Fast Hydration Guar Gum Powder also known as quick hydration guar gum powder is used in different industries like paper, textile processing, explosives, Oil & Shale Gas Industry, and many more industries. This guar gum powder achieves more than 85 % of viscosity as compared to regular guar gum powder. This the main reason for fast hydration guar gum powder is been considered as the best ingredient for oil and shale gas industry in order to increase the production. It belongs to the category of industrial grade guar gum. It helps to reduce friction significantly reducing the power cost of the overall drilling process. Due to the high viscosity of fast hydration guar gum powder, it is used for cooling of drill bits, cementing slurries, mud drilling where instant hydration and viscosity is required. Along with its function of viscosity it is also been used as thickener, stabilizer & suspending agent in oil well stimulation, mud drilling, oil well manufacturing including different industries as well. 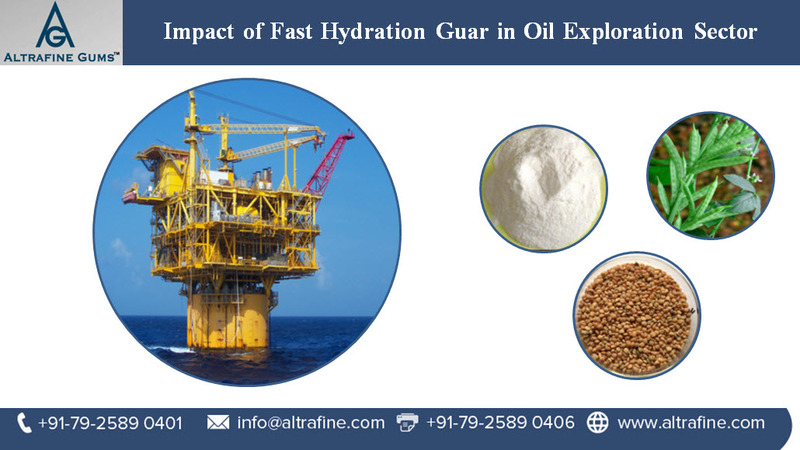 These qualities of fast hydration guar gum powder help to increase the industrial capacity to sustain oil recovery. It is been considered highly cost-effective in the oil extraction process. Altrafine Gums offers fast hydration guar gum powder so as to grasp and helps to meet the diverse needs of the customers. We offer a product with excellent features like long shelf-life, transparency, and precision composition. Thus, our effort satisfies the diverse needs of the market competently. Our other products include guar gum powder, cassia tora powder, tamarind kernel powder, sesbania gum powder, fenugreek gum powder, and many more products. To know more about the product contact us today and also get acquainted with other products been used in different industries. This entry was posted in Fast Hydration Guar Gum Powder by Ajit Patel. Bookmark the permalink.